The heavy duty steel mail house features powder coat paint in 5 contemporary colors. Mail is dropped through the front stainless steel flap and retrieved through the front door. Includes lock with two keys. Can be mounted to the wall or on your post. Mounting holes in the back are to be drilled in the field to match job site needs. A non locking thumb latch (related item #4188 at bottom of this page) is available as an option upon request. May be used for U.S.P.S. residential door mail delivery. Master postal lock not required. 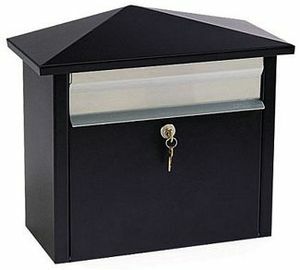 The Mail House can also be used as a freestanding mailbox by adding one of the post options.